Opening and fueling (or feeding) the minds of students is the purpose of education and ultimately what every family wants for their children. For 15 years, I’ve been an educator and I have never been more optimistic about the future of education in Florida. Today, families have a range of diverse options for quality education for their children in grades Kindergarten-12, whether they attend their traditional brick-and-mortar public school, are home schooled, attend virtual public school through Florida Virtual School Full Time, go to a blended online/on-site public school in some states, or choose to enroll their children anywhere in between to learn. Education is no longer one-size-fits-all; not every educational institution is the right fit for every child. That’s why I am thankful for learning options and am celebrating National School Choice Week. Families of students who are hospitalized or homebound, training to be actors or professional athletes, or learn at a faster or slower pace, should be empowered to choose the academic environment that best cultivates learning in their children. 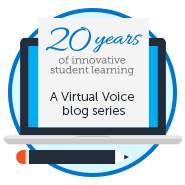 Exciting things are happening nationally to offer more choice to learners, such as flexible pacing options in some states to give students the option to learn over the course of a full calendar year or graduate early, as well as blended learning options that enable high school students to spend four hours a day at school and the rest interning, volunteering, dually enrolled on a college campus, or learning a trade skill. I have seen parents and older students actively choose and become more informed about their family’s educational options by visiting schools, shadowing students, attending information sessions and school fairs, and speaking with other families. Parents’ social networks are also an influential source of information about school options, according to research by the Annie E. Casey Foundation. Flexibility in location and services such as after-school programs, tutoring, and innovative online curriculum have sparked school district partnerships and ultimately benefited whole communities. I encourage you to learn more about the ways families are elevating the quality of education through choice by scheduling a school visit or attending a school choice event this week. 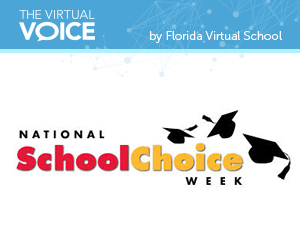 Please join me Florida Virtual School Full Time in celebrating National School Choice Week and all of the quality educational options in Florida. This post was written by guest blogger Esilda Ross and originally published by The Gainesville Sun. School Choice Week (recognized the last week in January) celebrates student options in education. Esilda Ross is lead principal, grades K-8, for Florida Virtual School Full Time. 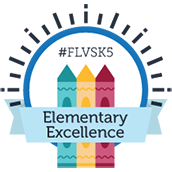 This entry was posted in Educator Edition, Homeschool Edition, Parent Edition, Student Edition and tagged Education, Educational Options, Florida Virtual School, School Choice Week, Student choice, Student Success on January 31, 2014 by Guest Blogger.